Alright then, moving right along from Cinco de Mayo and on to Mother’s Day. That makes for a pretty great week if you ask me! 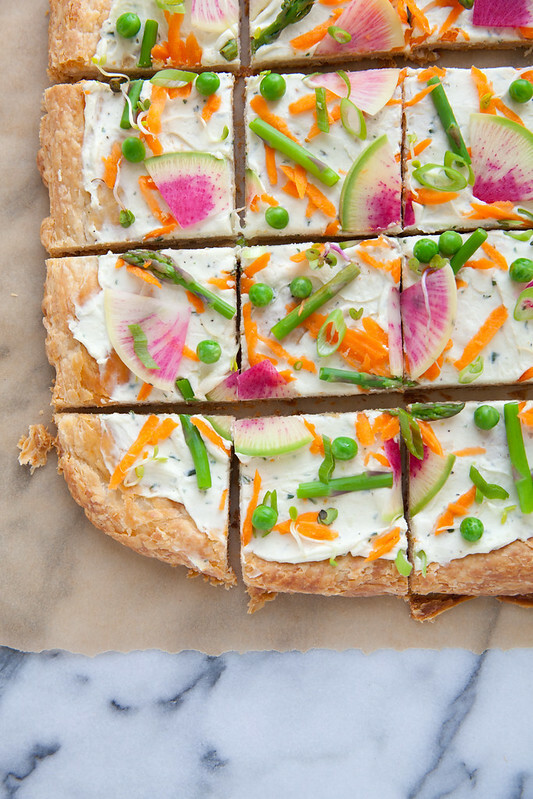 You know the tired old veggie pizza made with canned dough that is served at parties everywhere? I’m not a big fan. The concept has a lot of potential but in my experience, the reality is lacking in flavor and often with a mushy texture. If we’re going to do something, let’s do it right! 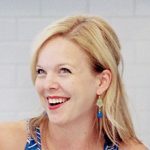 I wanted to give this classic party dish a much needed makeover. Puff pastry (homemade if possible!) lays a perfect flaky, buttery foundation for this dish. 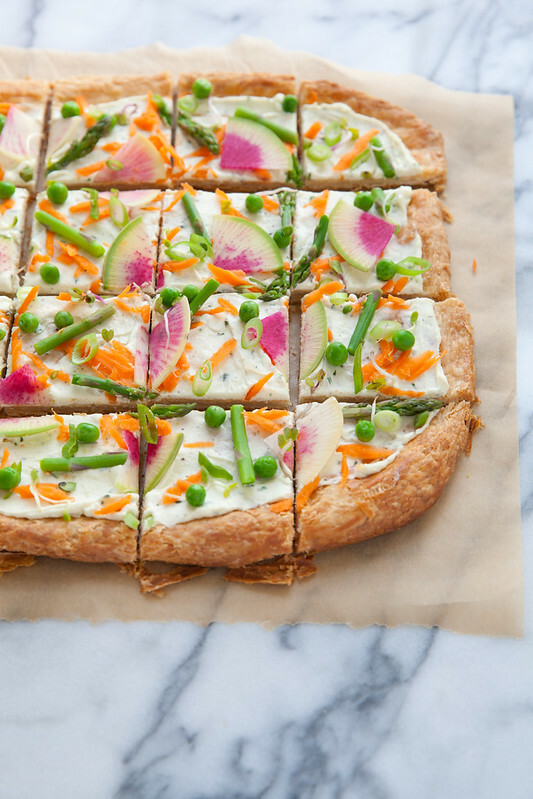 A homemade Parmesan herb cream cheese replaces bottled dressing or pre-seasoned spreads, and an array of colorful spring veggies completes this simple tart. I had a hunch that this would be good but my oh my, this is the weak in the knees kind of good. This would surely be a lovely addition to a Mother’s Day celebration this weekend, whether it is brunch, light lunch or the started for a special dinner. This version is definitely worthy of becoming a party staple. Preheat the oven to 400˚ F. Line a baking sheet with parchment paper or a silicone baking mat. On a lightly floured work surface, roll the puff pastry sheet into a 12 x 12-inch square. Transfer to the prepared baking sheet. Use your hands to press down the center of the puff pastry dough, leaving a thicker ¾-inch rim around the edge for the crust. Lightly brush the sheet of puff pastry with the egg wash. Layer a second sheet of parchment paper over the puff pastry, then fill the center indentation with baking beads to weigh it down. (Dried beans or rice also work.) Bake until well puffed and beginning to brown, about 24 minutes total. Remove the baking beads and parchment and bake about 4-5 minutes more, until golden brown. Transfer the baking sheet to a wire rack and let cool completely before proceeding. Transfer the cooled puff pastry to a serving platter. In a small bowl, combine the cream cheese, Parmesan, garlic, basil, and rosemary. Season with salt and pepper to taste. Add in the milk and stir the mixture together until creamy and evenly combined. (This can also be done in a small bowl of a food processor.) Spread the cheese mixture in an even layer over the puff pastry. Trim away the woody ends of the asparagus and chop into 1-inch pieces. Blanch in a small pot of boiling water for 30 seconds. Remove immediately with a slotted spoon and let cool. 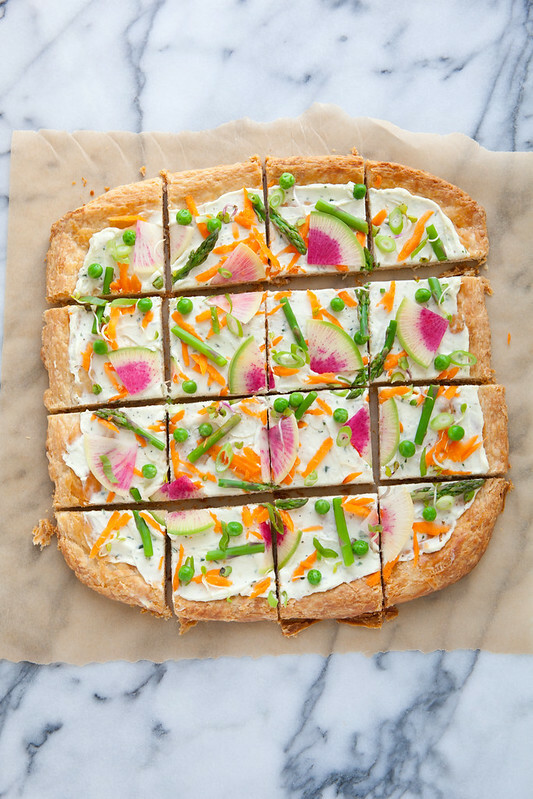 Layer the asparagus, radish, peas, scallion, carrot, and microgreens over the tart. Slice into squares and serve.